While two-thirds of Americans see at least some improvement in the jobs situation from the depths of the Great Recession, most (60%) say the jobs recovery has been only partial, according to a Pew Research Center report earlier this month. 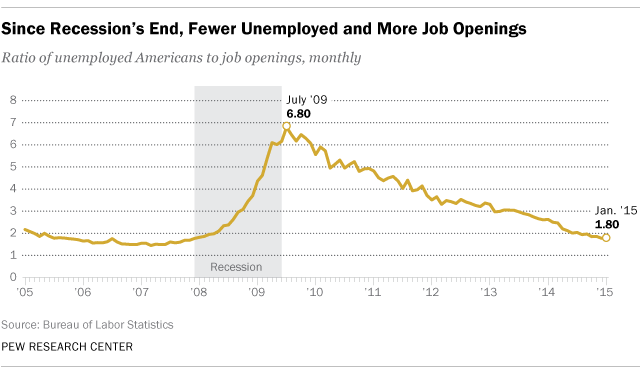 But by at least one measure – the number of unemployed people per job opening – things are just about back to normal. In January, there were 1.8 unemployed people per open position, according to the latest Job Openings and Labor Turnover Survey (or JOLTS) and jobs report from the Bureau of Labor Statistics. While that may sound disheartening, it’s actually well within pre-recession norms: Between January 2005 and December 2007, the number of unemployed people per opening varied between 1.45 and 2.17, and averaged 1.68 over the entire three-year period. But once the recession turned from ordinary into “Great,” the unemployed-to-openings ratio soared – peaking at 6.8 in July 2009, a month after the recession’s official end. It’s been trending downward since then as employers have stepped up hiring. The Pew Research survey found that public perceptions of improvement in the job situation had risen sharply since September 2013, when only 47% said jobs had fully (2%) or partially (45%) recovered. 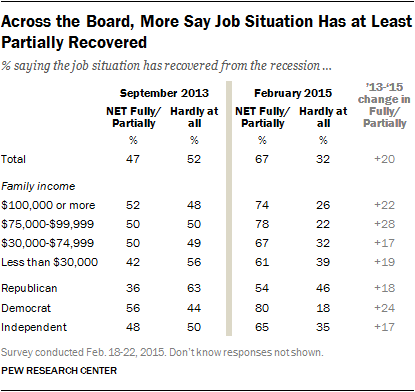 Although the rosier views spanned partisan and income divides, Democrats were much more likely than Republicans and independents to say they saw a jobs recovery. If you’re looking for work, service industries in the South and West might be your best bet. Those regions had the highest job openings rates in January (3.6% each), and the sectors with the highest rates were leisure and hospitality (particularly accommodation and food services, at 5.1%) and professional and business services (4.5%).